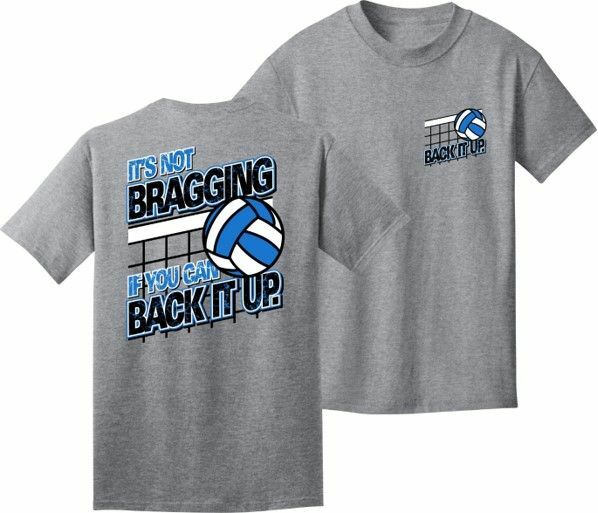 IT'S NOT BRAGGING - IF YOU BACK IT UP Oxford Grey Volleyball Tee Shirt from Utopia Sport features both a front and a back design with a great bold statement about your voleyball game! The front design features a net & ball with the words Back It Up, the back of the volleyball shirt also has a net & ball graphic and reads It's Not Bragging, If You Can Back It Up. This volleyball shirt is printed with white, black and bright blue ink. A Fun Volleyball Shirt which is sure to be a hit with players of all ages. Front Image Size = 3.5" wide x 3" high. . . Back Image Size = 8.5" wide x 10.5" high. 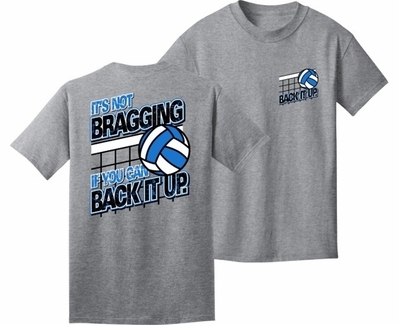 Not Bragging... Back It Up Volleyball Short Sleeve Shirt is a 90% Cotton / 10% Polyester blend.